A safari in Africa comes with a certain mysterious pull—the romance of a bygone era. 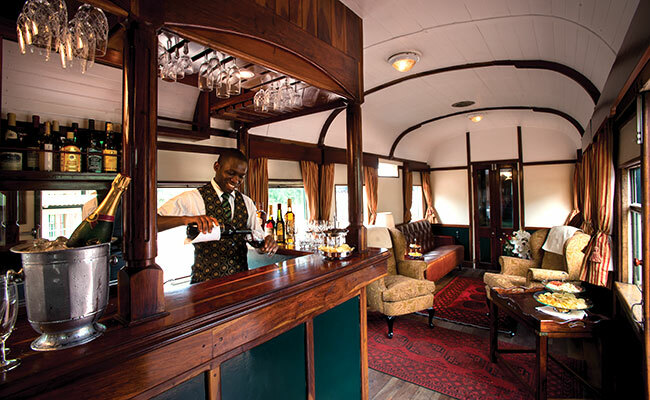 And nothing completes the picture of an opulent, old-world expedition through the wilds of Africa like riding the exquisite Rovos Rail from place to place! 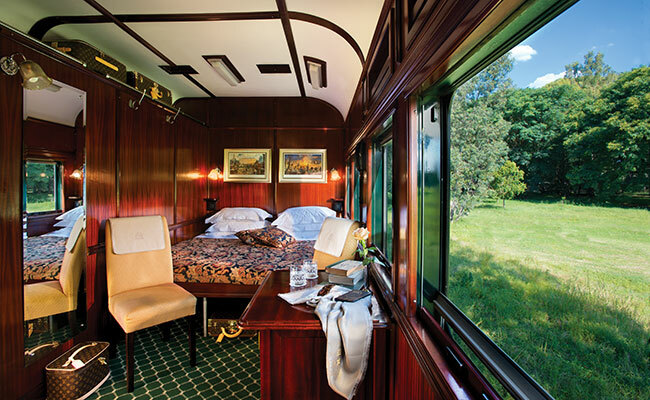 I had the pleasure of riding the Rovos Rail on my very first trip to South Africa, and I would wholeheartedly recommend the experience. Exploring South Africa’s world-famous safari parks and playing some of the best golf courses in the Southern Hemisphere was a once-in-a-lifetime adventure. On top of that, throw in traveling through pristine countryside via luxury rail, and you have a showstopper! Like on a cruise, you can really settle in once you board the train. My Deluxe Suite was well equipped with space to unpack, store my suitcases out of sight, and have my own private ensuite including a shower, toilet, and sink. Large picture windows and a very comfy bed led to some great lazy afternoons—the perfect way to relax after a wonderful morning of viewing game or playing a round of golf. Life aboard the Rovos Rail is truly a culinary journey: a chance to try regional cuisine in style. Formal dinners (black tie) are served as one sitting and South African wines are paired with each meal. There were two cars dedicated to dining, plus two additional lounges that are perfect for watching the world go by or enjoying an after-dinner drink with new acquaintances. The Observation Car is a great escape. I never felt like I was lacking for break-out space to make this trip my own! One of the first things I noticed was the number of countries represented onboard the Rovos Rail. It wasn’t just your fellow American explorers. We walked away from this trip with friends from Scotland, South Africa, and Australia, all of whom we will meet again for golf somewhere else in the world! The conversations were lively, and it was great to have a chance to dine with other people if you choose. One huge bonus of a rail journey like this is having the same team taking care of you throughout your entire trip. Not only do they get to know you, but they tailor your service based on your tastes and preferences. They pay attention to the little things, like when you want your coffee in the mornings and what newspapers you wish to read; if and when you might like to try a specialized whiskey; right down to how you like your clothes returned after laundry. Perhaps you’ll mention an interest in big cats, and later find a book about leopards sitting next to your glass of wine. This type of personalized service really takes your trip to the next level! Rovos Rail own their own railway lines and don’t have to share with anyone else. That means they often pull up for the evenings to allow for a great night’s rest. The excellent food and wine helps, too! There are ample touring options for those not golfing, as well as a chance for golfers to get some safari game drives in between rounds. These journeys are great for those couples who like to travel together, split during the day, and meet up again at happy hour to share stories. And the courses you get to play will certainly make for some interesting stories! 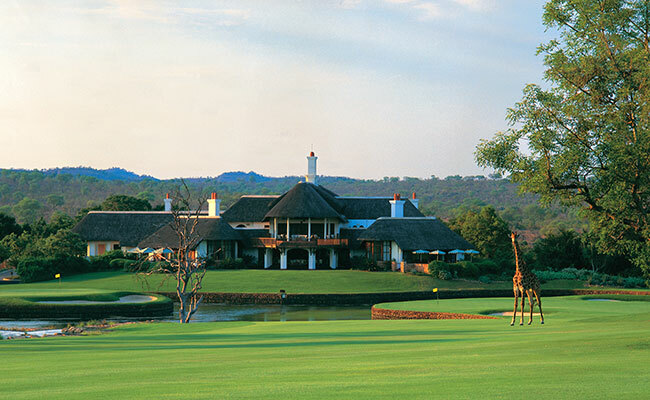 Leopard Creek: Sitting on a plateau overlooking Kruger National Park, and bordered by the famous Crocodile River, Leopard Creek is the most exclusive South Africa golf experience you can get. There are bronze statues on every tee box, island greens on the 9th and 18th holes, and a par 3 which requires a solid strike of the ball over Harry’s (the resident hippo) waterhole. A must-play for anyone coming to golf in South Africa! Durban Country Club: Built in 1922, this course is steeped in history and features a lovely Cape Dutch style along with stunning coastal views. Cheeky vervet monkeys will pop by to say hi. This course has excellent caddies, which help elevate everyone’s game. Champagne Sports Resort: Nestled in the Drakensberg mountain range, this course features target golf where the rough can be punishing and there are several blind tee shots. If you’re not playing your A game, the gorgeous scenery helps make a memorable day. Zimbali Country Club: Located on a Golf Estate, this course is great for all golfing levels. It plays like two distinct golf courses: an 11-hole links and a 7-hole coastal forest. Carts are compulsory. 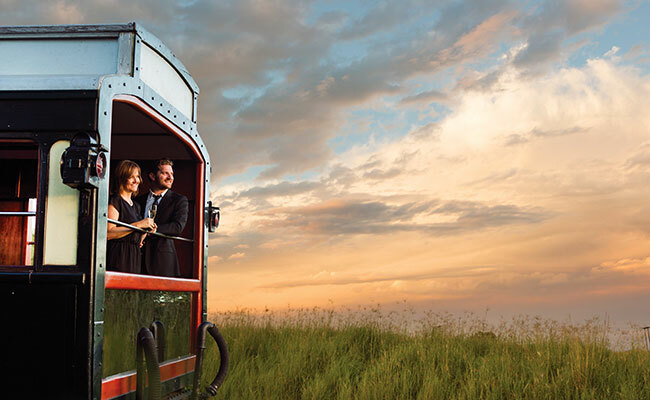 Experience the Rovos Rail for yourself! Browse rail journeys, golf vacations, and South Africa travel packages. Contact our Africa travel experts to start planning your handcrafted trip!